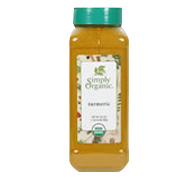 Our organic ground turmeric has a wonderful, golden-yellow color and a pungent, distinctive aroma. Its flavor resembles both ginger and pepper. Indispensable in curry powders and East Indian cooking, turmeric is also used in prepared mustard and pickles, dressings, eggs and rice dishes. Simply Organic Turmeric Root Ground is shipped in a discrete, unmarked package. Orders are processed immediately and usually take about 3 to 5 working days to be received. We do ask that you try it for 2 to 3 weeks to feel the full effects. Any information received is used only for order processing and shipping purposes. Your information, such as e-mail address, will never be disclosed to a third party.